Also, to introduce you to the purpose and heart of , I am offering my first giveaway. 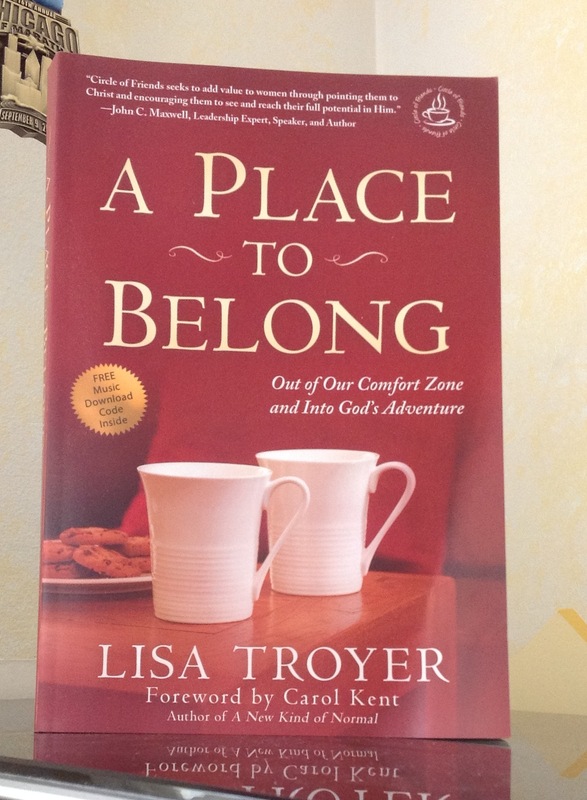 It is the book A Place to Belong by Lisa Troyer, President of Circle of Friends ministry. The mission of Circle of Friends is to honor Jesus Christ through meeting the needs of women in our local, national and international communities. Does the title of the book speak to you? Have you ever needed a place to belong? A place of acceptance, authenticity, affirmation, accountability, and action with other women? A safe place to be? How many times have I needed a safe place to be with other women, especially when walking the most vulnerable and difficult times of life? Not only am I privileged to partner with them in ministry as one of their devotional writers, but I want to share their ministry with others, and share safe places with others through A Place To Belong. Author Lisa Troyer shares with honestly the depression and other personal struggles she has encounters. She shares the life-giving hope authentic relationship with other women provide. She also includes the ability to use this book for a bible study and small group resource for starting a Circle of Friends group. Won’t you join me in entering the world of authentic, safe relationships? This is my first giveaway. I don’t receive any compensation from giveaways I may have. Beyond the Picket Fence is a ministry, and it’s my commitment to readers to share things that will minister the hope and grace of Jesus Christ. A Place to Belong does that and I would like to share it with one of my readers. To enter once, please email me at yoderbl@gmail.com with your name, email address, and physical address so I can mail it to you if you will! subscribing to Life Beyond the Picket Fence, joining the Facebook page, or joining the ministry on Twitter. If you do all three, then you will be entered each time for each one you’ve partnered with us in! There is an average of over 100 readers per post at Life Beyond the Picket Fence and it would be my privilege to get to know more about you – to interact with you and for you to share hope, truth, or encouragement that you receive from this ministry with others through these venues! And share the news about the giveaway – A Place to Belong is a must read for women.